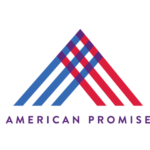 American Promise is the fiercely cross-partisan, citizen-powered organization built to win the 28th Amendment. With a structure of support we help all Americans to develop Civic Courage to act locally and connect on a national network for the grassroots effort required to reclaim a government run by people not money. The cause of our time is to give Congress the power to set reasonable spending limits in American elections, reverse the damage of Citizens United v. FEC, and restore human liberty, equal citizenship, and responsible self-government. The 28th Amendment to the Constitution of the United States of America is the way. And we are well on our way!